With our finger always on the pulse of digital transformation, Influential Software is using the new Metalogix website to promote our latest partnership. Our clients can now benefit from our expertise in the ultimate set of solutions for Microsoft SharePoint, Office 365, and Exchange. Influential Software’s consulting services for Metalogix guarantee a targeted solution, at the lowest cost, with the maximum return. This partnership means you can move, manage, and protect your valuable content more effectively than ever before. The Content Matrix tool provides for one-hop migrations and consolidations. Essentials for Office 365 simplifies migrations from SharePoint, Box, Dropbox, Google Drive, personal drives, and file shares. Archive Manager Files Edition automates archiving, management, and security capabilities, freeing your workforce from time-consuming tasks. Archive Manager Exchange Edition has won countless People’s Choice Awards for its effective search capabilities and automatic management. Metalogix ControlPoint provides automation and control of permissions management, user activity, and sensitive content. Metalogix Diagnostic Manager streamlines tasks such as troubleshooting server performance, SQL optimisation, network connectivity, and browser settings. Metalogix SharePoint Backup promises as much as a 50-percent reduction in project times. Metalogix RestorePoint accelerates your restore of corrupted, old, lost, or overwritten content. Metalogix Sensitive Content Manager negates the false positive rates of other DLP systems by being specially designed for SharePoint. Metalogix Expert is a SharePoint analysis tool that gives the insights you need to plan migration, optimise storage, and protect against security risks. Content.ly connects your collaborative software so that all teams can speak to each other. Metalogix Replicator synchronises SharePoint content internationally, allowing team-based collaboration even across limited bandwidths. Metalogix StoragePoint is a Remote Blob Storage (RBS) solution that delivers cost-effective storage while maintaining performance. The range of solutions above – used individually or in combination – offer a wide degree of flexibility for all use cases. Our Metalogix partnership gives us the tools to identify and optimise these solutions to maximum effect. Eager to learn more about our Metalogix services? Feel free to visit our dedicated site. After a great end to 2017, Influential Software made a strong start to 2018, with a number of new clients joining our ranks. High-profile organisations across the government, investment, logistics, and IT sectors engaged our team to transform their IT landscapes. From business intelligence to training, consultancy to upgrades, migration to licence sales, these companies drew on the gamut of Influential Software’s award-winning services. As an overall trend, we’ve seen that UK businesses are embracing the need to transform. They have seen the success of agile services, customer-centric practices, and intelligent planning. They see that the cycle of innovation and disruption is very much a reality. The question is, how to navigate the digital transformation? Our history of digital excellence, our ever-expanding expertise, and our best-value promise have all made Influential Software the natural choice for these companies. If you’re considering the next step, it’s easy to find out what you can achieve with Influential Software. 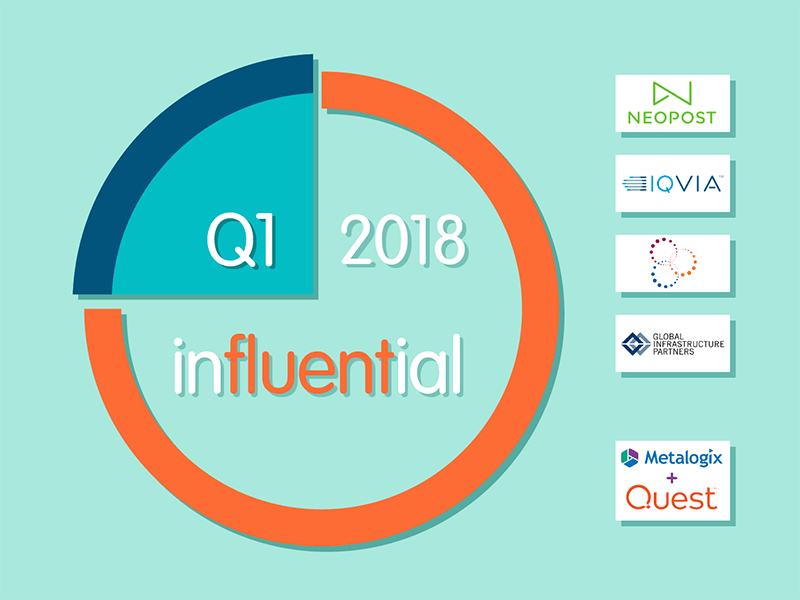 Influential Software became a Metalogix Partner in Q1, 2018. Thanks to this partnership, our clients can benefit from cutting-edge SharePoint and Office 365 solutions and expertise. For more details, why not visit our dedicated site? Neopost, founded in 1924, provides business communication solutions for the sending and receiving of mail, parcels, and emails. The company also offers software services to assist with multichannel customer communications, electronic document management, data quality, and shipping. Neopost powers Royal Mail’s Parcelforce.com despatch manager and Royal Mail’s shipping API. Influential Software’s respected services within big data, APIs, and business intelligence were an excellent match for Neopost. IQVIA is an American multinational company, active in the fields of health IT and clinical research. IQVIA combines services across healthcare data, analytics, and technology to provide innovative solutions in disease prevention and treatment. Drawing on databases of over 200 million patients, IQVIA uses algorithms to identify high-risk patients with super-human accuracy. Having worked with both healthcare organisations and IT companies, Influential Software’s mix of experience complemented IQVIA’s profile perfectly. Mid Kent Services (formerly Mid Kent Improvement Partnership) is the product of a 2008 agreement between Maidstone Borough Council, Swale Borough Council, and Tunbridge Wells Borough Council. These three councils work in a flexible arrangement to improve service delivery and reduce service costs for residents across Mid-Kent. The councils within Mid Kent Services cooperate in the provision of services including environmental health, audits, human resources, ICT, legal, parking enforcement, planning support, and revenues and benefits. Our experience with other local councils, such as North Lanarkshire Council and South Ayrshire Council, was attractive to Mid Kent Services – on top of our universal reputation for excellence. Global Infrastructure Partners (GIP) is an infrastructure fund manager, with interests in operational management and an equity fund, Global Infrastructure Partners III. The company investments in infrastructure assets in the energy, transport, waste, and water sectors. GIP also has a credit arm, GIP Credit, which provides solutions for greenfield and brownfield projects, acquisition finance, liquidity and growth, restructuring and secondary purchases. GIP is another addition to our experience within transport and infrastructure, following on from clients such as Port of Dover and Colas Rail. After such an encouraging start to 2018, we can’t wait to see where Influential Software heads next. But one thing’s for sure: there are many influential clients yet to come. With hands-on projects across the financial services, publishing, manufacturing, healthcare, higher education, government, and public sectors, our team melds business experience with software expertise. Find out how your organisation could benefit – talk to one of our advisors today. 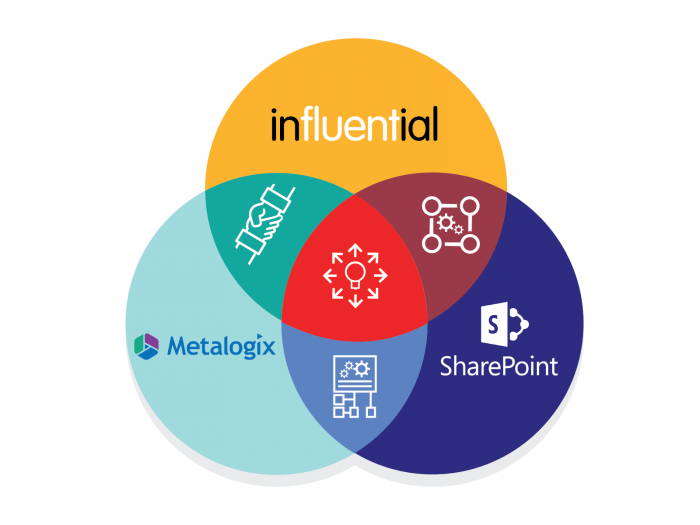 Influential are pleased to announce an exciting new partnership with Microsoft migration specialists Metalogix, further enhancing our Microsoft portfolio and ensuring our clients an array of cutting edge SharePoint and Office 365 solutions and expertise. Metalogix solutions move, manage and protect content that lives within and around Microsoft SharePoint, Exchange and Office 365. This ensures your business has the freedom to collaborate and removes the risk of information loss. No matter what platform your business is using, on-premises or in the cloud. Over the last 15 years Metalogix has grown into a global brand, recently bringing its solutions under the banner of Quest. From the start, Metalogix has defined not only the future of SharePoint and Office 365 management but also how organisations collaborate in complex environments. The company has learned a lot along the way, having seen first hand the struggles businesses have constantly moving content across collaborative environments, locally and in the cloud. How the battle between human resources, technical and business priorities, and even networking logistics, can push the limits of project management and delivery. As a result Metalogix have focused on developing products and solutions that remove the need for deeper human interactions without compromise on speed. Influential-Metalogix solutions bring flexibility and scalability to project planning and delivery, enabling even a single administrator to accomplish more during migrations. Microsoft SharePoint and Microsoft Office 365 have been a game changer when it comes to collaborative workspace environments. From company intranets to secure document management systems, on premise and in the cloud, they continue to be at the cutting edge of scalable enterprise solutions and have helped make Microsoft current world leaders in this field. However, it’s not always straightforward for Enterprises to fully leverage Microsoft products. It’s here where trusted Microsoft partners, with vast industry knowledge and decades of experience, can ensure your business gets the full value. This is particularly true of SharePoint and Office 365 environments and migration. Influential and Metalogix are perfectly positioned to deliver the most comprehensive Microsoft Partner solutions. We can help your business deliver the results you expect, and that your business stakeholders and clients need.